The Day Song is much too long for inclusion here and the Night Song has the same tune. It was used by Vaughan Williams as the tune for No. 638 of the English Hymnal, but he gave it the name of “Southill” because it was sent to him by a Southill man. Chris Marsom who sang this to me had many tales to tell of the reception the Mayers had from some of the ladies who were strangers to the village and became apprehensive at the approach of a body of men to their cottage after midnight on May Eve. 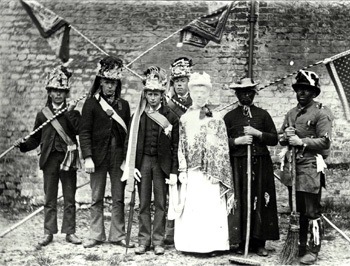 There’s more information on May Day customs in and around Northill – and some nice old photos – on the Bedfordshire and Luton Archives and Records Service website. Young men going maying including the bride and Moggers and Moggies. And finally – before we get to the song itself (which is very short) here’s a link to a recently posted May Day video from Pete Castle. Pete lived in Bedfordshire in the seventies and eighties, and he met and recorded Mrs Marjorie “Mum” Johnstone who had sung a couple of May songs for Fred Hamer some 20 years earlier. The video has “Mum” singing the two songs, and talking about her involvement in May Day customs as a young girl. Collected by Bob Copper in the 1950s, from Jim Swain of Angmering in Sussex. The words and music can be found in Bob’s book Songs and Southern Breezes, and you can hear Jim Swain singing the song on The Voice of the People Volume 10. I first heard the song on Shirley Collins’ 1974 LP Adieu to Old England. I was surprised to find that this song shares the same Roud number as ‘As Broad as I was Walking‘. There’s little to link them on the surface, and a Roud number search of the Take Six Archive suggests that collected versions are either like ‘As Broad…’ or like ‘Banks…’ but not both. So while Mrs Webb’s ‘The Modest Maid’ is obviously a version of ‘Abroad as I was walking’, other songs such as Moses Blake’s ‘Nancy’ or Moses Mills’ ‘Twas Down in the Valley’ are clearly related to ‘Banks of the Mossen’. The same seems to be true of ballads on the Bodleian site: Harding B 17(196a) – ‘Modest Maid’ is without doubt a precursor of ‘Abroad as I was walking’ (in fact the words as sung by Mr Johnson seem to have changed very little from the broadside version); and Harding B 17(78b) – ‘Down in Yonder Valley’ seems to show how ‘Banks…’ started life. 18th century broadsides which showed they were the same song called Beautiful Nancy… An Evans printing is in the Madden Collection, but you can view a Pitts version slightly later, called ‘Down in Yonder Valley’ on the Bodl site, Harding B17 (78). The Madden Collection, unfortunately, has not been made available online (come on Cambridge!) so I’ll have to take Steve’s word for it. ‘Mossen’ by the way in my understanding is a saxon plural ie ‘mosses’, rather than the name of a river, in other words it is ‘mossy banks’ good for lambs and love, rather [than] riverbanks. A suitably sombre song for Good Friday. I learned this many, many years ago from the singing of Norma Waterson on the Watersons’ seminal 1965 LP Frost and Fire. (A note for the uninitiated: it is a legal requirement that certain album titles be preceded by the word “seminal”, and Frost and Fire is certainly one of those). This spring-time ballad-carol tells a story based on the Apocryphal Gospels, concerning a trip made by Mary to see her son at Calvary, in the company of seven virgins. 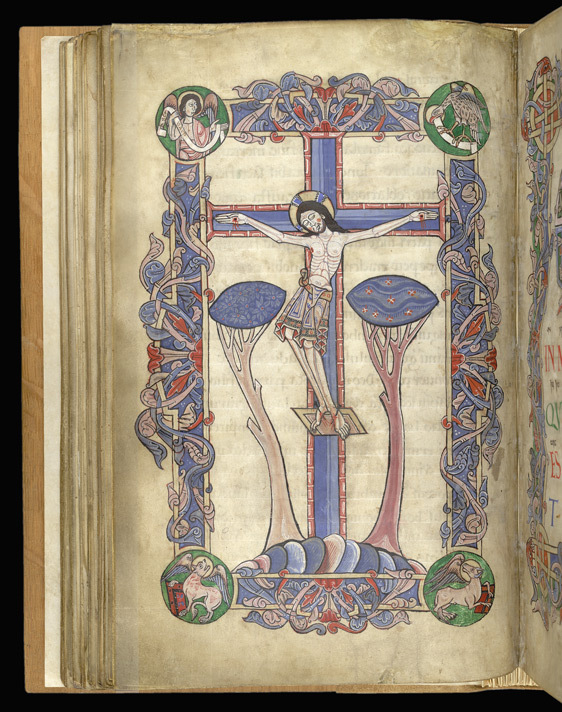 The opening recalls the handsome illuminations in the Arundel Psalter, showing the sombre tree of death with its dismal birds, and the dazzling tree of life with iridescent leaves. The parallel between the death and resurrection of Christ and the ritual slaying and renewal of the divine kings of pagan belief (echoed in the mumming plays) needs no stressing. Melody and a version of the text from Mrs Whatton and Mrs Loveridge, The Homme, Dilwyn. From Twelve Traditional Carols from Herefordshire (Leather and Vaughan Williams), Stainer & Bell. Cf Popular Carols, by F Sidwick (Sidwick and Jackson). This fine example of the way in which a mystical vision is created by the best folk-poetry appeared in the Staffordshire A Good Christmas Box. 1847, Sylvester (1861) printed a version of it from an ‘old Birmingham broadside’. Sir A Quiller-Couch included it in the Oxford Book of English Verse, and Walter de la Mare in Come Hither. In really important news yesterday, the English Folk Dance & Song Society announced that they had been successful in applying for funding to proceed with the Full English project. This will digitise and make freely available the folk song collections of Cecil Sharp, Vaughan Williams, Lucy Broadwood and a host of others. So in future, if we want for instance to check out all of the collected versions of this song, we will be able to do so at the click of a mouse. Excellent news. One of the versions which Vaughan Williams collected came from the gypsy singer Mrs Esther Smith, mother of May Bradley, from whom Fred Hamer recorded the song some 50 years later. You can hear May Bradley sing the song on the Musical Traditions CD Sweet Swansea.